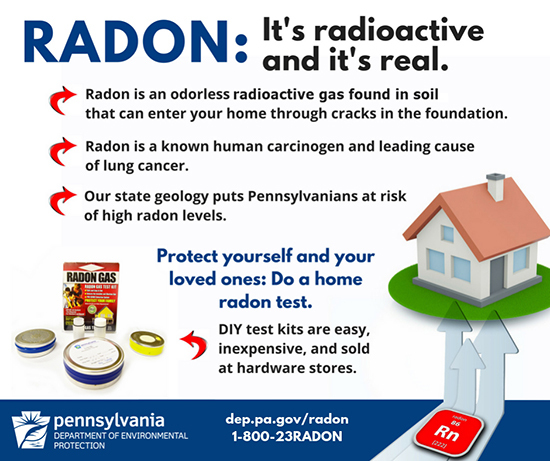 An estimated 40 percent of Pennsylvania homes, including many in our area, have higher levels of radon than national safety standards, due to the state’s geology. However, residents can perform a simple test to detect this gas, which can cause lung cancer. Certified AARP TaxAide volunteers are available again this year to provide free tax form assistance to middle- and low-income taxpayers, with special attention to those over age 60. To receive help filing 2018 federal, state and local tax returns or PA property tax and rent rebate applications, taxpayers must bring copies of their 2017 tax returns plus all income information, real estate tax receipts, any deduction information and health care enrollment information pertaining to 2018. Taxpayers must also bring photo ID, Social Security cards, and if they want refunds direct deposited, then bring a bank check to ensure the volunteers have the correct account numbers. Tax help will be available during the times and days listed at the following locations in our area from February through April. Emmaus Moravian Church, Main and Keystone streets, 9 a.m. to 12:30 pm, Tuesdays by appointment starting Feb. 5. Appointments can be made at the church on Tuesday, Jan. 29. Southern Lehigh Public Library, 3200 Preston Lane, Center Valley, 1-4 p.m., Wednesdays starting Feb. 7. All PennDOT driver license and photo centers will be closed Saturday, Jan. 19, through Monday, Jan. 21, in observance of Martin Luther King Jr. Day. Customers may still obtain a variety of driver and vehicle products and services, including all forms, publications and driver training manuals, online at www.dmv.pa.gov.